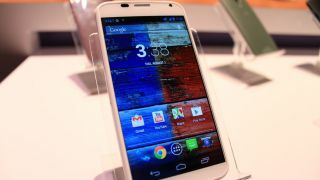 The Moto X looks like a solid handset, but why isn't it coming out outside of the USA? The universe is expanding due to a phenomenon known as dark energy. No one knows what it is, how it works, or how to explain it. All we know is that it's pushing all the galaxies in the observable universe further and further apart - it's a divisive flavour of energy to say the least. In the tech universe, meanwhile, the TechRadar reviews section is also expanding. But instead of invoking theoretical physics to explain this fact, we're able to explicate that it's because of non-dark energy being spent relentlessly testing the latest gadgets and gear. For example. I recently ate a lovely burrito and spent all of the energy derived from it reviewing a TV. Do you see?